We see ourselves as being on a learning journey together, and we have chosen to represent our school as a fishing boat on this journey. 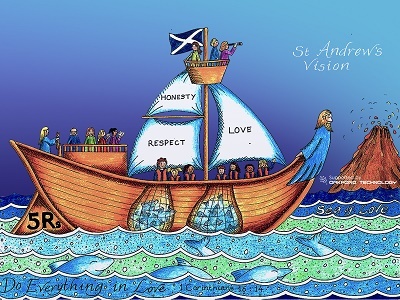 We felt this was appropriate for us, as St Andrew himself was a fisherman. We are a Church of England School, so we understand that God loves us. We show this by being loving, honest and respectful. Our Christian Values are at the forefront of what we do here in school. We need these values to keep us moving forward. The teachings of the Bible show us a good way to live our lives and guide us in our learning. At St Andrew’s School, we all aim to be BUBBLING LEARNERS. This means that we try our hardest in everything that we do through continuous effort. Our learning values of reflectiveness, reciprocity, resilience and resourcefulness help us to do this. Our school works together as a team. We encourage and inspire each other. We are keen to learn and bring interesting knowledge and skills in to our classrooms. We are led on our learning journey by our caring Head Teacher and staff who are steering us in the right direction. Our supportive governors look at how the school has worked in the past and plan a way forward for us all. Our parents are supportive of us and the school. They help us in our learning and are an important part of our school lives. We warmly welcome you to our school and our St Andrew’s family.